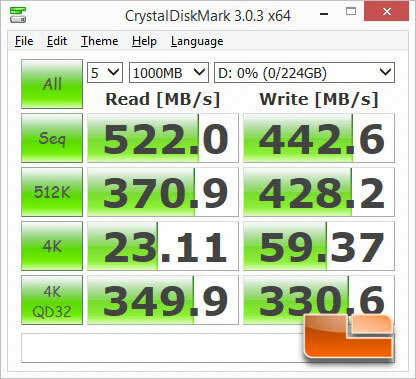 The SATA III 6Gbps performance testing was completed using a Corsair Force GT 240Gb SATA III 6Gbps SSD. Benchmark Results: The GIGABYTE X99-Gaming G1 WiFi was able to hit a sequential read of 522.2MB/s and a sequential write of 441.8MB/s. The read is the fastest of our Intel X99 motherboards to date, though it is still a hair behind the performance of the Intel Z97 platform. 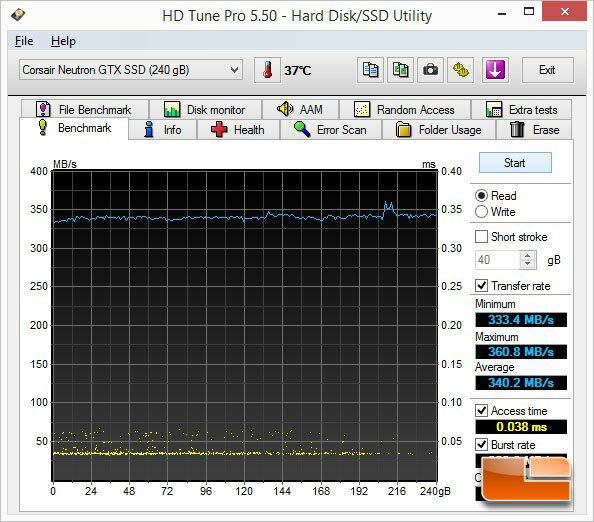 HD Tune Pro 5.50 is an extended version of HD Tune which includes many new features such as write benchmark, secure erasing, AAM setting, folder usage view, disk monitor, command line parameters and file benchmark. Benchmark Results: The GIGABYTE X99 Gaming G1 WiFi motherboard was able to hit 345.1MB/s average read and 315.3MB/s average write in HD Tune 5.50.